Going out for shopping ? the order, press the call button. Select a particular product with LIVE offer . Select the required quantity. Press the BLOCK button . Press the CONFIRM button.Press the Call button to know current stock availability and to get confirmation on your order. Your BLOCKID will be generated and it can be seen in the right side drop down menu in the ‘My Block History’ page. Rush to the shop, show your LHD BlockiD at the shop to avail the discount. Collect it from the shop and make the payment(with discounted rate) at the shop. 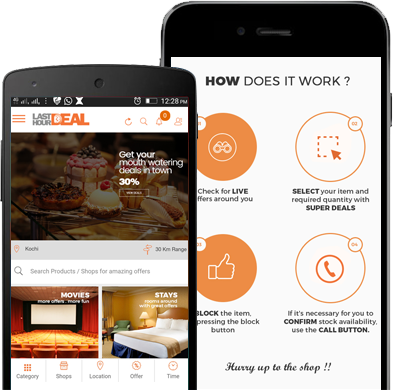 LASTHOURDEAL is a technology based platform which acts as an intermediary service between stores and customers where customers can find mind blowing deals around, for a particular time frame, where in customers can SELECT a product on discounted rate, BLOCK a particular quantity and BUY it from the respective store, by making payment at the STORE. (The service is absolutely free).